Marianglea Montanari: balsamic vinegar maker, balsamic expert, and balsamic superwoman. We just spent a very exciting week with Mariangela, setting the city on fire… or better, setting the city on balsamic. And by balsamic we mean, Traditional Balsamic Vinegar of Modena. 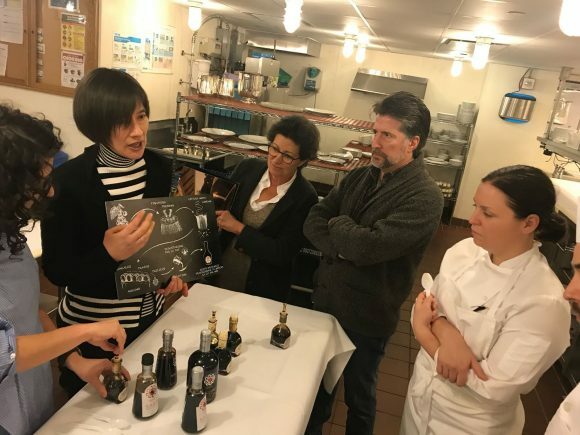 Mariangela talking balsamic vinegar with Chef Melissa and her team at Del Posto. Our friend Matt from Rubiner’s came along for the balsamico lesson. Mariangela is one of the few producers of balsamic vinegar that makes balsamic in the traditional way. As Mariangela explained during her many visits, real balsamic vinegar should be made of just one ingredient: grape. In fact, Mariangela is one of the only producers of balsamic vinegar that farms her own grapes. They are all certified organic grapes. 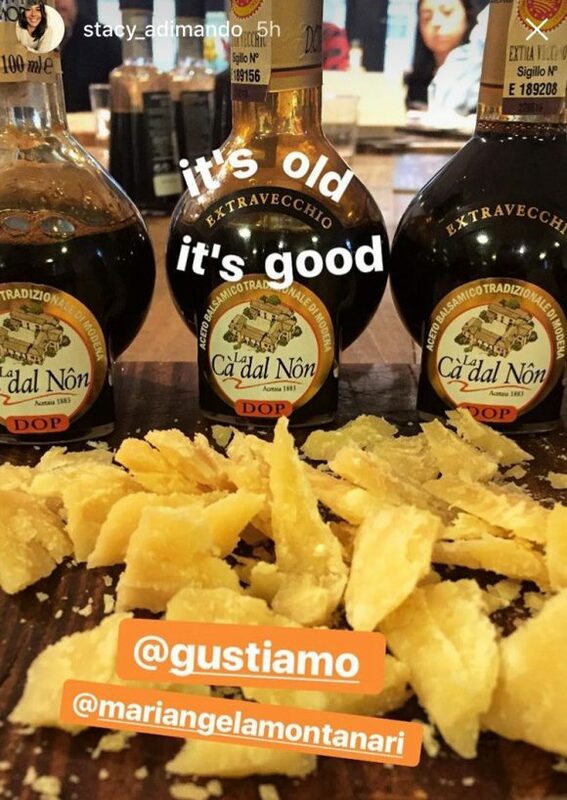 At Saveur, Stacy Adimando’s Instagram Story, learning about just how damn old good balsamic vinegar is. We did many Balsamic lessons, from the Bronx to Brooklyn, we tasted pure saba, balsamic saba, Traditional Balsamic Vinegar aged 12 years, and Traditional Balsamic Vinegar aged 25 years. We talked a lot about the difference between what Mariangela is doing and the ethically questionable practices of IGP balsamic. Did you know that there are only 10,000 liters of Traditional Balsamic Vinegar made per year, but there are 100,000,000 liters of IGP balsamic vinegar made per year? Mariangela’s visit was very educational! Mariangela even recorded an episode of The Food Seen with Michael Harlan Turkell. But it wasn’t all lessons and interviews, we also partied. We threw a balsamic bash with Paige of Archestratus and Michael HT, after all, he wrote the book Acid Trip. It was a blast, there were even balsamic negroni cocktails. Chef Stefano Corvucci from CIBO in Bologna cooked octopus salad, frittata, pear crostini, and buffalo ricotta dolce; yes, all made with balsamic! 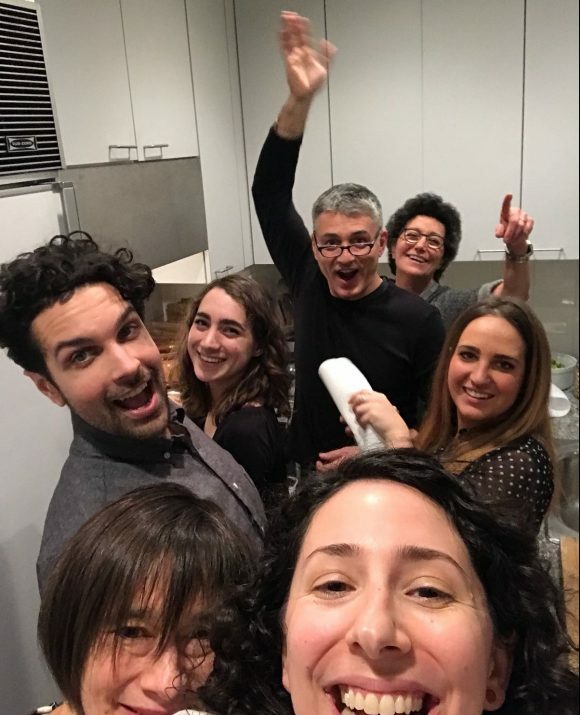 Kitchen shenanigans In the Gusti R&D Test Kitchen with Marianglea Balsamico, Chef Stefano, and the Gusti Team. Mariangela, we love you. We are happy that we had the chance to teach NYC about real balsamic vinegar AND we are very happy to have helped you conquer your claustrophobia (thanks MTA!). Come back soon.